Walking down the main drag of Radiator Springs is such a lovely experience. On a bright, cheery, sunny day, the immersive ambiance and friendly disposition of the town is enough to wipe those worries away. And it's a joy to stumble upon each of the sites. Take the Cozy Cone Motel. With its well manicured lawn, adorable headlight flower gardens, and welcoming signage, it marks a wonderful place to stop and relax. Of course, here at Disney California Adventure, rather than actually sleep in, the rest is for a gastronomical recharge. Whether it be meals in cone form, or a deliciously refreshing (and sugar filled) Red's Apple Freeze, or the ice cream or churro bites, there is plenty to sooth the digestive soul. So stop on by. 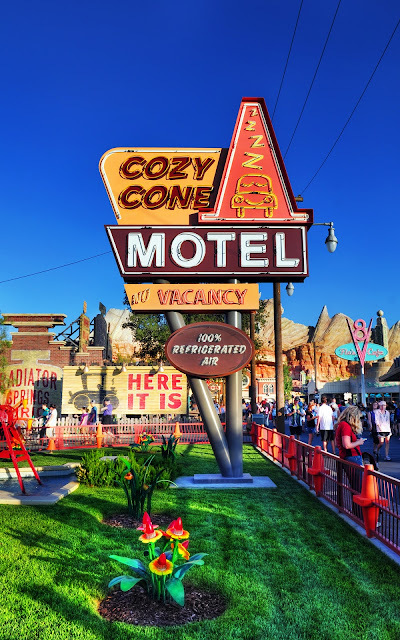 Heck, as the sign on the adjacent Radiator Springs Curios shop even proclaims... Here it is! It being food and merriment!